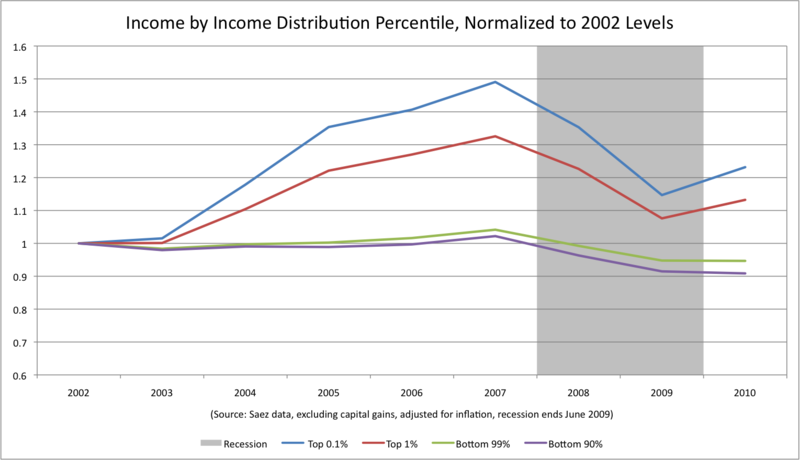 That elite sliver reaped 93 percent of the post-recession income gains. Is extreme inequality America's new normal? There was a brief debate focused on the following question: Would the gains of the economy continue to accrue to the top 1 percent once the recovery started, or would they have a weak post-recession showing in terms of raw income growth as well as income share of the economy? The top 1 percent had a rough Great Recession. They absorbed 50 percent of the income losses, and their share of income dropped from 23.5 percent to 18.1 percent. Was this a new state of affairs, or would the 1 percent bounce back in 2010? The bottom 90 percent of Americans lost $127, the bottom 99 percent of Americans gained $80, and the top 1 percent gained $105,637. 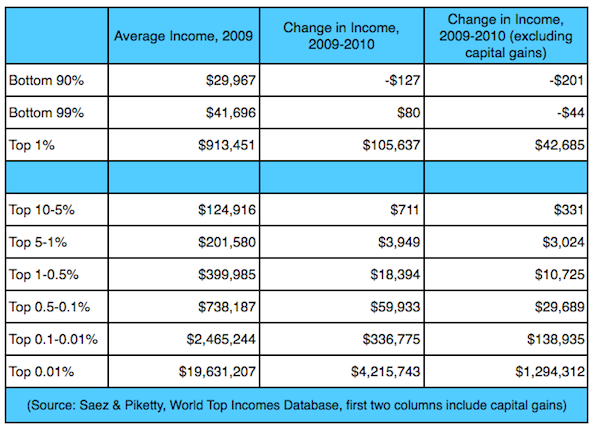 The bottom 99 percent is net positive for the year due to around $125 in average capital gains. They can take comfort in efforts by the right to set the capital gains tax to 0 percent, which would have netted them an additional couple dozen bucks. And if this wasn’t obvious, you can see the gains become quite high the farther you walk up the inequality ladder. When we discuss things like the Buffett Rule or taxing capital gains as ordinary income, it is important to see how top-heavy that capital gains distribution actually is. The Great Recession dropped income for the bottom 99 percent by 11.6 percent, completely wiping out the meager gains of the Bush years. And crucially, while 2010 was a year of continued stagnation for the economy as a whole, the 1 percent began to show strong gains even when capital gains are excluded. There are two things worth mentioning. There’s an interesting debate within left-liberal circles about whether or not elite economic interests benefit from a weak recovery, benefit more from a strong recovery, are vaguely indifferent to the United States economy, are impotent during the recession, or are more interested in pursuing other agendas during the instability caused by mass unemployment. These numbers are certainly a point for the argument that the rich are doing just fine, and to whatever extent they’d be doing better with more robust growth and employment, it isn’t putting a damper on their earnings. It’s also worth mentioning that, pre-recession, inequality hadn’t been that high since the Great Depression, and we are quickly returning to that state. It’s important to remember that a series of choices were made during the New Deal to react to runaway inequality, including changes to progressive taxation, financial regulation, monetary policy, labor unionization, and the provisioning of public goods and guaranteed social insurance. A battle will be fought over the next decade — it’s already been fought for the past three years — on all these fronts. The subsequent resolution will determine how broadly shared prosperity is going forward and whether our economy will continue to be as unstable as it has been.